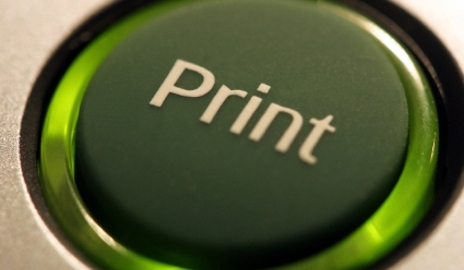 Is printing at home on the way out? Tech’s making it easier to carry around documents without the need to print things on paper. There’s also the expense of printing that’s holding many us back – are you printing less at home? My desk is covered in paper – most are my scribblings, but I do still print a fair amount because I find it easier to read copy and spot errors on paper. However, when it comes to reports I’m much more likely to view them on my smartphone, so I reckon I must print less than I used to. But are we all printing less? Last week, Kodak announced it will stop selling consumer inkjet printers in 2013, instead continuing with just ink and paper. And earlier this year, Lexmark announced a shift of focus to office printers rather than general consumer home printers. These changes are probably more attributable to money problems in Kodak’s case, since HP, Canon and Epson hold such dominant positions in the printer marketplace. I’m not sure the possibility of us printing less at home has contributed to Kodak’s demise. Back in 2010 when we asked 1,400 people about their printing habits, 31% said they don’t print photos at home. When we asked a similar question a year later, the proportion of people saying they don’t print photos dropped to just 21%. I can’t remember the last time I printed a photo, but there are clearly plenty of people who do. More than 90% of the people surveyed said they print black text, colour text and emails. Around 80% print maps, with 35% of people using a colour setting other than draft, which is hardly likely to be sparing on ink. With Google maps on my smartphone, maps are one thing I know I print less of, and airline apps mean I don’t have to print as many boarding passes. Still, that only saves about four sheets of paper a year. So, technology has had a small impact on my printing habits, but I can’t see myself living an entirely print-free existence. Could you? Do you still print things out on paper at home? It’s nice that you have the possibility with Canon printers of running the cartridge until you judge that it is empty. On my Epson SX415 it immediately stops printing when it senses that the cartridge is empty, and you can do nothing until a replacement has been fitted. With the CIS this is not a major problem – you just press a switch on the cartridge block to reset the printer. However, it still goes through a cleaning and charging cycle every time it does so, which wastes ink and, further, it does not even wait until the end of a page when it does stop, which can be a nuisance if you are printing a multipage document. As to various comments about ink usage over different colours, my experience is that when I top up my 100 ml bottles, usually when the lowest colour is at about 20ml, all of the others (2 others on the SX415, 4 on the Epson 1290) each have less than 40ml left. My rusty maths suggests that this usage variation is within about 15% of each colour. Printer manufacturers are holding us to ransom with ink. You don;t buy a car that will only run on fuel supplied by the manufacturer. While i don’t mind companies recommending you use their inks and i don’t really object as strongly to them insisting that warranties are invalidated if you use someone else’s inks, what i really rage over is chips which prohibit the use of compatible inks. It seems to me that if i want to use cheap ink in my printer to get cheap copies, even at the expense of my printer’s working life, that should be my decision. I am somewhat outraged every time i ponder on how they get away with it. I have a Canon MP600R. I leave it switched on all the time to avoid repetitive cleaning cycles, stick with Canon ink (from Amazon/IJT generally) and ignore the ink-out warnings – lots more pages printed before it goes streaky. I do a moderate amount of printing – a family calendar just completed printing totalled 160 photos, 160 double sided pages, all colour – plus a fair bit of other colour printing on cartridges 6 months old with life in them still. However I have also tried draft-quality for less important documents – silly not to have done so before! Perfectly acceptable, and quicker. I think that we sometimes take for granted just how good printers are these days, considering their cost – producing decent colour photos, high quality printing, copying and scanning.